OS grid reference: SE 0742 4446. 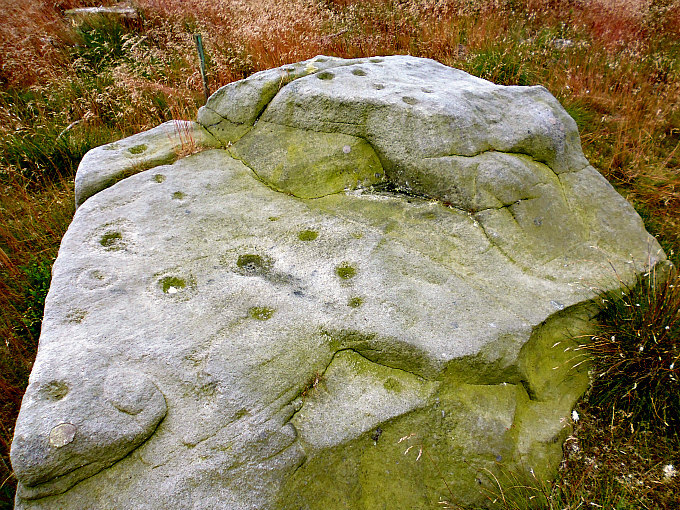 In close proximity to the Ordnance Survey triangulation pillar (no: S4563) at the north-western side of Rivock Edge, near Riddlesden, west Yorkshire, there are several prehistoric cup-and-ring marked rocks. However, some of these carved rocks are easily missed as they now lie amongst dead tree branches and stumps – the forest here having been cut down in the last couple of years. 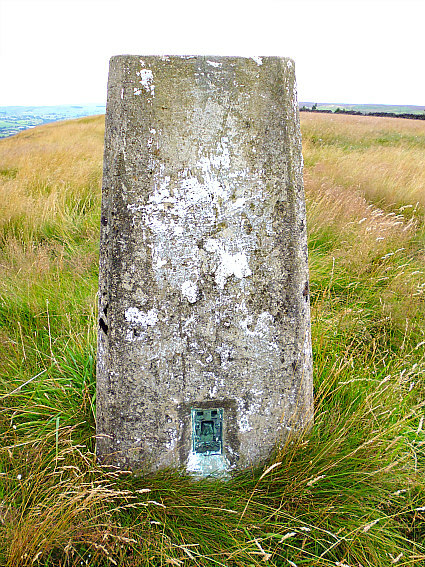 The trig point on Rivock Edge can be accessed from Silsden Road – to the north-west of Riddlesden. A footpath runs north-west across a field to a wall stile, then walk towards the television mast, but before that take the footpath (not the trackway) that heads north-east around the northern-side of Rivock Edge to Rivock Oven Cave. From here walk up-hill and head south-west across the wood-strewn moor, keeping sight of the wall and concrete trig pillar. It’s now just a case of looking out for the many large and small cup-marked stones and rocks, and they are widely scattered about. Cup-And-Ring Marked Rock at Rivock Edge. 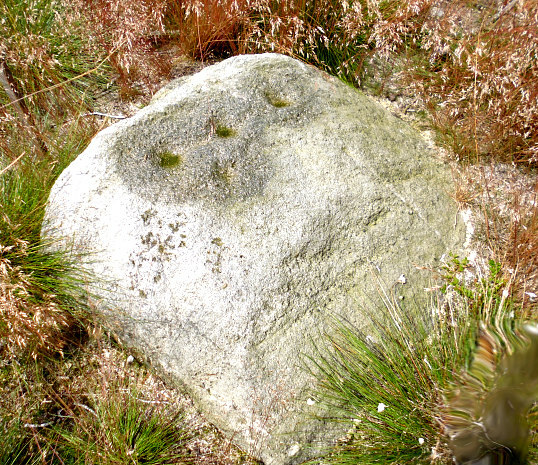 Cup-and-ring marked rock on Rivock Edge. One of the best cup-and-ring marked rocks on this part of the moor is undoubtedly, in my opinion, the large gritstone rock located some 350m east of the trig point (SE 0743 4462). From the trig pillar follow the footpath east beyond the wall. This large, weather-worn rock has several well-defined cups and also a few that have faint concentric rings. Other carved rocks and stones can be found in the vicinity of the wall, while others are a bit further away. There may well be some that are hidden beneath the tree foliage, and a few that are still unrecorded. Cup-marked rock on Rivock Edge, west Yorks. 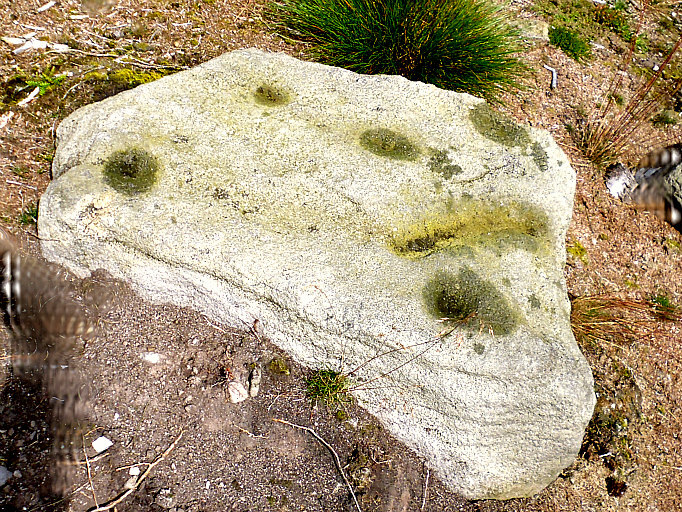 Cup-marks are circular depressions on rocks, usually on flat-sided gritstone and sandstone rocks, but not exclusively so, and often but not always these are surrounded by concentric circles. Sometimes these circular depressions and rings are joined or intersected with gulleys or lines running from other cup-marks; other patterns and designs can sometimes be seen on these rocks too. They are sometimes confused with larger, deeper depressions, or holes in the rock’s surface that are caused by natural water erosion; these are generally steep-sided. 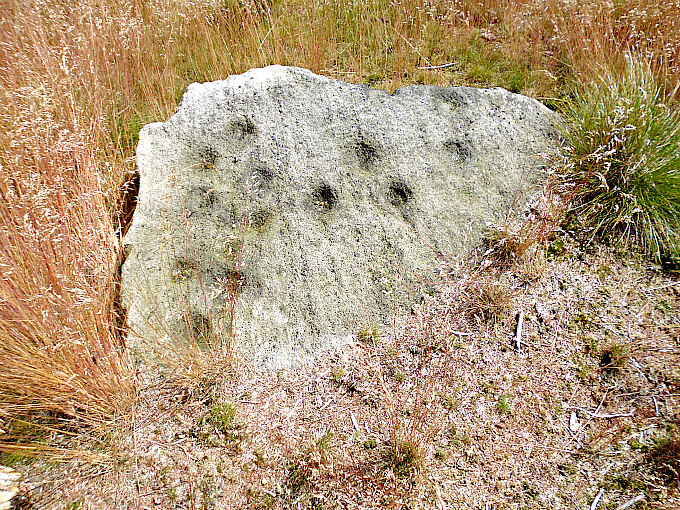 Stone with cup-marks on Rivock Edge, west Yorks. 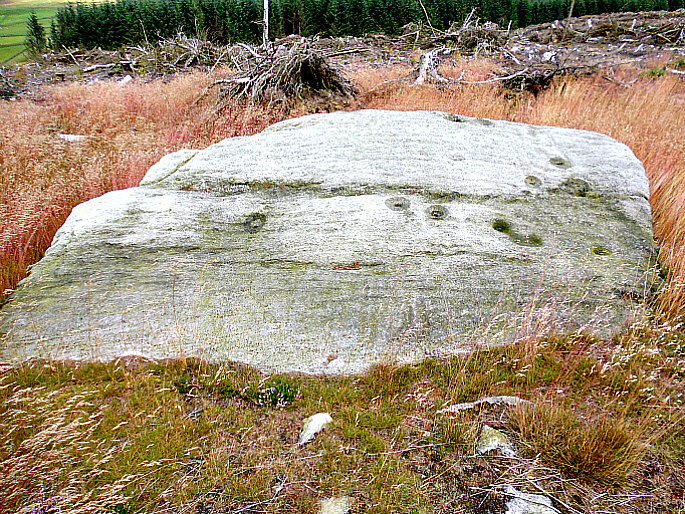 Large rock with cup-marks, Rivock Edge. These ancient carvings (petroglyphs) or rock-art, have generally been dated to the Neolithic, but they are perhaps more likely to date from the early Bronze Age. But no-one seems to know, with any ‘real’ certainty, what they actually represent or signify, or why they were carved on rocks high-up on the bleak, windswept moors. Were these prehistoric cups-and-rings carved onto rocks to represent the stars or were they perhaps maps of the stars, or maybe maps showing where burials were located, or sacred places, springs, ancient pathways and caves that were, at that time, only known to our ancient ancestors? Or were they simply the doodlings and graffiti of ancient peoples? So these carvings must remain, for the time being at least, something of an “ancient enigma”. Probably we will never really know their true meaning or symbolism. 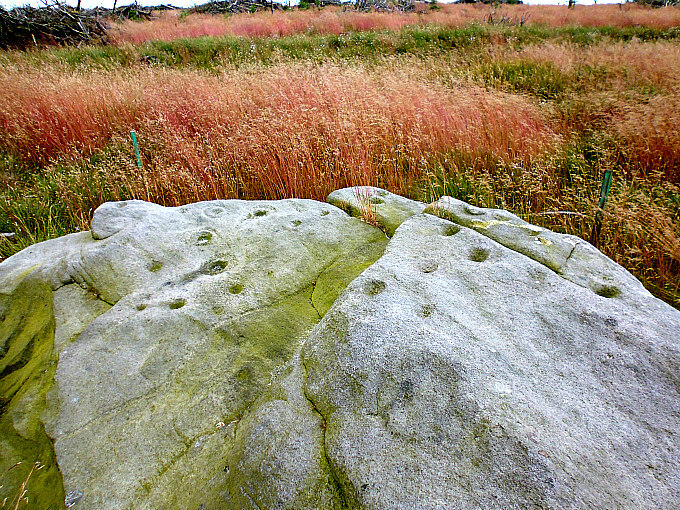 Author John Dixon in his work ‘Journeys Through Brigantia’, (Volume One), says of these mysterious carvings that: A comprehensive field study of the cup and ring stones of the moor has been published by the Yorkshire Archaeological Service. From that survey a few broad conclusions are possible. John goes on to say that: “We can be sure however that the stones themselves were sacred in ancient times. The kings of the Picts, the most ancient people we can identify by name in the Isles, were proclaimed upon a stone. The Stone of Scone is now incorporated into the English Coronation Throne in Westminster Abbey. At Hexham and Beverly the thrones of the Anglo-Saxon bishoplords exist cut from a single stone. “Throughout history and throughout the world ancient places of assembly are often signified by stones or physical features—unchanging in a changing world. The signifi-cance of certain stones being stressed by the marking of the stone. Sacred marked stones can indeed be found worldwide, from Ilkley Moor to Ayers Rock. Dixon, John & Phillip, Journeys Through Brigantia, Volume One: Walks in Craven, Airedale and Wharfedale. Aussteiger Publications, Barnoldswick, 1990. Categories: Cup-And-Ring Markings, Rock-Art | Tags: Cup-And-Ring Marked Rocks on Rivock Edge near Riddlesden in West Yorkshire | Permalink.